The warm heart of the home. Like many old-school bits of kit, the solid fuel Rayburn Range was built to last. Heavy, robust, simple to operate and easily maintainable by anyone with the least mechanical aptitude and common sense. They're the original biomass boiler, still going strong. In contrast with modern claimants to that title, they're not fussy about fuel, unlikely to break down, don't require years of study to be able to run and maintain and they even boast a wider range of functionality. What new biomass boiler can you cook your food on, as well as heat your house and water? The price you pay for all this is a modest one: None of its functions are automated. You run it. You look after it. This is not a mysterious box in a cupboard, which you only come into any sort of contact with when the dreaded breakdown occurs or it needs its annual service and you call in a technician to do the job. This is a piece of equipment that you come to know well. That you work with to provide energy for cooking and heating. It's not for nothing that they used to be referred to as 'the heart of the home'. I'm going to say it now, at the outset. Read the manual! All the need-to-know basics are covered and you can work the rest out, with a bit of effort. What I'll provide in this post is the fuller description of routine maintenance that I wish I could have read when getting to know our Rayburn. The daily tasks of feeding the fire with wood or coal, emptying out the ash and keeping the surfaces generally clean soon become nearly as automatic as breathing. After that come the less frequent but equally important chores, like the big clean needed every month or six weeks. As the unit is running all day every day, soot, tar, and fly ash build up on the inner surfaces, flue ways and, of course, the chimney. Once you know what to do and how to do it, you're only talking about an hour or so of effort, every month or so, to keep things in peak operating condition. To start with, let the fire go out overnight, so that the range is cool enough to work on in the morning. If you're going to sweep the chimney (and it's nearly always a good idea to do these jobs together), do that first. I use a rotary sweeping kit, with flexible nylon rods and bristles, which is powered with a hand drill, and sweep the chimney from the bottom up, using the access point into the flue just above the range. Dust separator and vacuum cleaner. Next, raise the hotplate lid and lift out the disk giving access to the area over the oven. All these surfaces get well furred over with brown fly ash, which is easily brushed or scraped off. When I first started doing this, I used a small fire shovel to lift out the debris. Then I discovered the magic of a dust separator (see photo) that attaches in line with the vacuum cleaner and separates out nearly all the fine ash and soot. The filters in the vacuum cleaner still need to be cleaned each time, but hey - it's good for them, and the time saving that comes with using suction power for cleaning is immense. After that, it's on to the flue ways at the back, behind the firebox. These can build up quite a heavy deposit of soot and tar, needing a sturdy scraper to shift them. Actually, I now tend to clean these when the fire is lit. The heat softened tar is much easier to scrape off and as it drops down into the fire box it simply burns away. Now we move on to the firebox itself. Brush away the fly ash from the underside of the hotplate and scrape off any chunks of tar or soot from the side and back of the box. Ash pan emptied into ash tidy. Next, empty out the ash pan. An ash tidy (see photo) is an incredible boon for this. The ash pan needs to be emptied twice daily and anyone who has ever handled a pan of hot ash will know how awkward and messy it can be. The ash tidy (just a steel box with a hinged lid of the correct dimensions to suit your ash pan) makes it all so much easier. The final step is to give the outer surfaces a good clean and polish, to leave the beast looking its magnificent best. I've met people who bought their house on the basis that it boasted a solid fuel Rayburn, but then were forced to get rid of it because it belched black smoke every time they dared open an aperture. If only I'd met them before they took that drastic step! 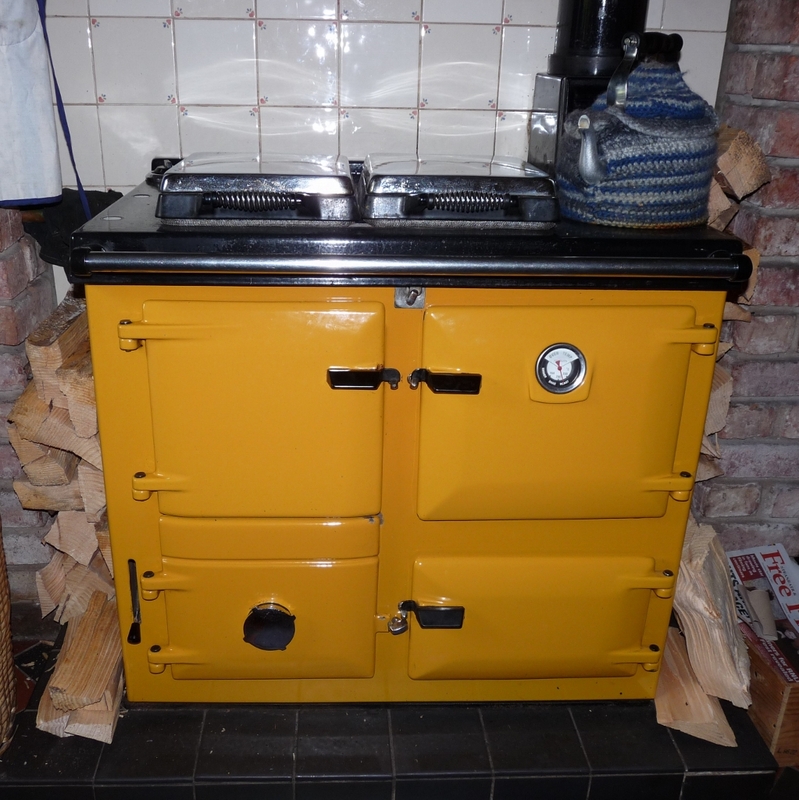 Our Rayburn was in a similar state when we moved in, but a proper clean out of the range and sweep of the chimney (we took 60 lbs of soot out of it that first time) put it into the beautiful running order in which it has since remained, thanks to a bit of regular TLC. A bit of elbow grease on the hotplate. We are about to move into a house we bought with a wood stove. I have never used one before but am excited to try. Hi Dayna - There is a bit of an adjustment period in getting used to the ways of cooking on wood, but it's totally worth it. Good luck with the move!